Under its new label, “ARMIN by ARMIN STROM”, ARMIN STROM AG is launching watches for which, for the first time, a complete movement structure has been designed in the company’s own ateliers and which focus on technology and the concept of manufacturing. 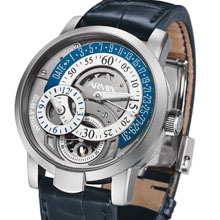 ARMIN STROM is well known for hand-skeletonised and unique timekeepers. This handcraft is deeply anchored in the brand and continues to constitute a key area of business for the company. Skeletonised watches have been produced in small series (each limited to 25 watches) for three years now and enjoy an excellent reputation among collectors worldwide. Even today, each watch is produced by hand and checked by the master Armin Strom himself. In addition to the skeletonising, the focus at ARMIN STROM is on the finishing of the watch movements, in particular the engraving of the visible parts. It is obvious from the BLUE CHIP models that the team at ARMIN STROM includes specialists in the art of movement finishing. With its own designs and technical image, the brand now intends to redefine its future and is launching the ARMIN by ARMIN STROM label. During Baselworld in 2008, the brand presented for the first time the prototype of the ELEMENTS series. For the first time ever, an entire movement structure for a regulator with retrograde date display was designed in-house. After delivery of the completed parts, these are finished using different technologies and then assembled. In view of the extremely positive customer feedback on the four watches, the team at Armin Strom, under the leadership of designer Claude Greisler, decided to develop these elements to perfection. Water, Air, Earth, Fire....are creative forces, the four fundamental elements that create matter. Each element is assigned a colour and symbol that can be found in the respective model. The hour, minute and second hands are positioned off centre. The retrograde date display forms a principal element of the watch. However, with the opening beside the small second hand the concept of skeletonising is retained and through the sapphire crystal back, the movement with hand winding remains visible. 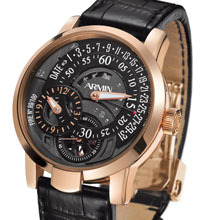 The new watch from ARMIN STROM is intended to be modern, innovative and bold, hence the name “ARMIN by ARMIN STROM”. On top of all this, the year 2009 will also herald a new, improved communications strategy. The two labels should also be easily recognizable. Everything will always revolve around the product, i.e. the watch. 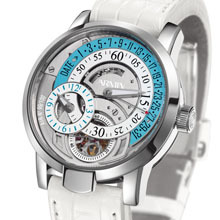 A connection between ARMIN STROM and ARMIN BY ARMIN STROM will be established by a stylized guilloche. A clear differentiation will be provided by contrasting colouring. an “in-house” constructed watch movement for these series. The retrograde date display is a principal element of this watch, whose hour, minute and second indication is positioned out of center. With the opening beside the small second hand the concept of skeletonising is retained and the movement with hand winding remains visible through the sapphire crystal case back. Part of the series are the models EARTH, AIR, WATER and FIRE, available in titanium. The four elements are reflected in the design and natural colouring of these models.